Kids Eat Free At IHOP !!!!! 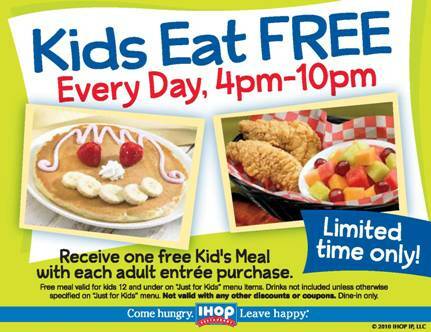 Kids Eat Free at Ihop! It’s a dinner deal that your family loves to eat. Get the family together and grab a table at IHOP®! Purchase one adult entrée and you’ll get one kids’ meal absolutely FREE! Yes, free! It’s one great time for the whole family. Pick your adult entrée, then let your kid choose one of these meals, FREE! Previous post Free Queso Day!!!! !